We are a coveted entity of this specified arena, engaged in manufacturing and supplying a durable assortment of Micro crystalline Cellulose. 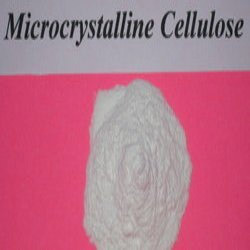 Micro crystalline cellulose is a term for refined wood pulp and is used as a texturizer, an anti-caking agent, a fat substitute, an emulsifier and a bulking agent in food production. The most common form is used as a vitamin tablets. Backed by a state of the art infrastructure, we are engaged in presenting a compact array of Microcrystalline cellulose. We offer this powder in these grades – MCCP-101, MCCP-102, MCCP-112 & MCCP -200 in Spraydried & in Non-Spraydried. According to I.P./USP/BP specifications. For its manufacturing, cellulose, collected from fibrous material, undergoes controlled hydrolysis with dilute mineral acid. It has high absorbent powers, and can be used as a suspending agent, tablet disintegrant and tablet & capsule diluent.